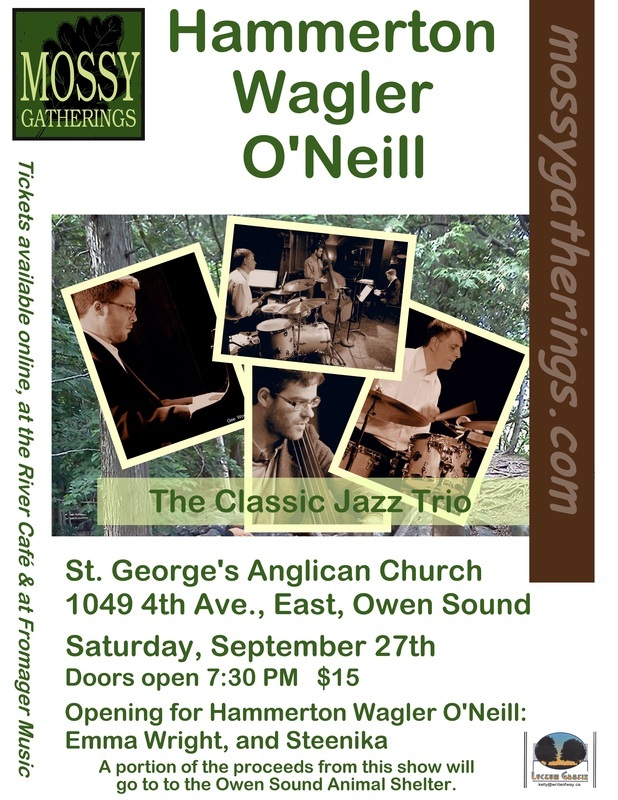 Hammerton/Wagler/O'Neill are excited to be releasing their debut CD as part of the 20km Jazz Diet series at Manhattans. Coming off another successful CD release show at The Jazz Room in Waterloo, they will be playing, at St. George's Church in Owen Sound, original songs from the new CD as well as interpretations of songs by Radiohead, The Beatles and many more! 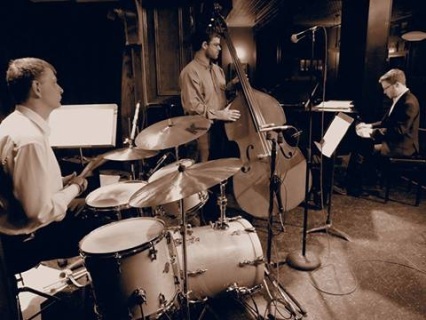 Piano/Bass/Drums - a classic jazz trio format. This trio is original music penned by Thomas, Tyler, and Dave. In the mix are tunes by Radiohead, the Beatles, Tears for Fears, and favourite songs from the massive catalogue known as the ‘standards repertoire’. Tyler Wagler is an in demand bassist as a performer and educator as his musical pursuits are diverse. He is at home in jazz, the blues, performing with gospel/folk singer David Sereda, roots reggae band Friendlyness & The Human Rights, Paul Quarrington, and Tannis Slimmon. In 2011, Tyler released his own CD as a singer/songwriter. Tyler is a graduate of Humber College where he studied bass with Don Thompson, Mike Downes and Pat Kilbride, and holds a Bachelor of Music from Thompson Rivers University. After several years of teaching and performing professionally in Toronto, Tyler now lives in Guelph, ON. Three of the country's most in-demand musicians -- pianist Thomas Hammerton, bassist Tyler Wagler and drummer Dave O'Neill -- combine to for a top -flight classic jazz trio. 80 cent charge for electronic services. Thank you for your understanding. We want to pay the musician as much as we can without deduct this from their fee. 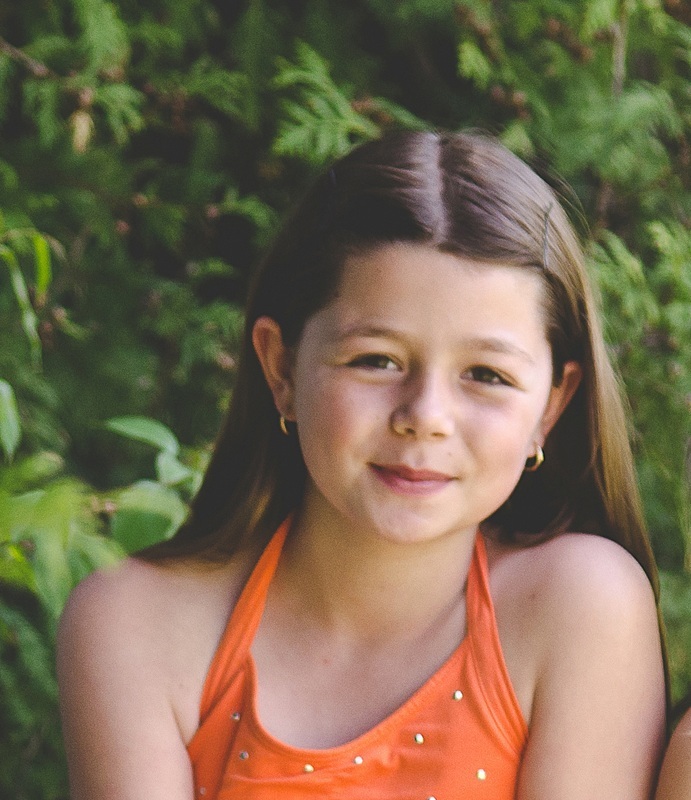 Emma Wright, a 10 year old from Meaford, loves to sing. Singing since she was five years old this power vocalist travels all over Ontario. Along with singing competitively and for charity functions Emma has been in the productions: The Sound of Music and Les Miserables at The Roxy Theatre in Owen Sound. 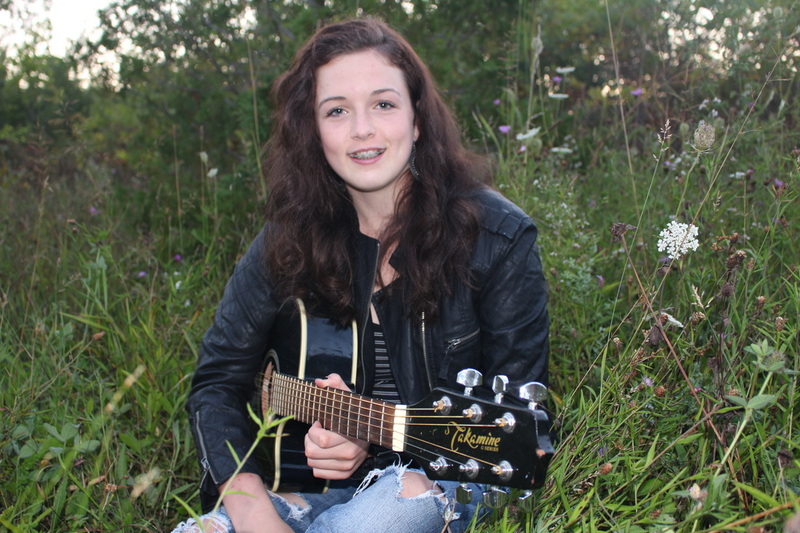 As a finalist for the past two years in the Georgian Bay Folk Society Youth Discoveries Showcase, a member of The Choir that Rocks, and as a student of Tara MacKenzie, Emma Wright's future is filled with exciting musical opportunities. Steenika Gilbert, a 15 year old from Wiarton, loves to express herself through music, like the sun shining through the trees. Her caring presence keeps everyone around her on the bright side of life. She is grateful for the people she meets along her journey who heighten her confidence to perform. Among those people are Canadian Independant Folk Sensation Drew McIvor and Winner of the Canadian Maple Blues Award singer Tara Mackenzie. Steenika is the recipient of the coveted music award at her school as well as first place standing at the Wiarton talent show. A portion of the proceeds from this show will go to to the Owen Sound Animal Shelter. This Shelter services the City of Owen Sound, Georgian Bluffs, Hanover, Saugeen First Nations and Saugeen Shores. It is also the holding Shelter for Grey Highlands Animal Control. This is a no-kill facility. The operators and staff are wonderful and kind people. The dog in this picture is named Whisper. He is from the shelter and is now living with Mossy Gatherings Artistic Director.